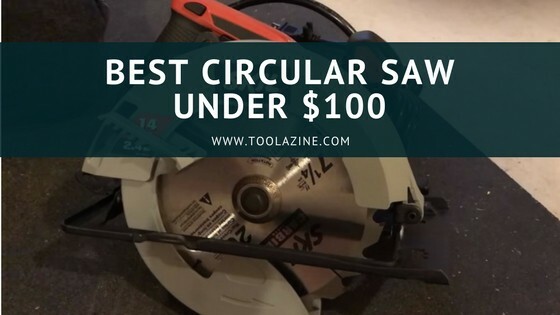 Are you looking for a circular saw and can’t seem to find a great one under $100? Well, good news I have reviewed the best ones on the market in this price category and trust me you’re going to want to keep on reading. My aim is to help you choose the one that best fits your needs, including your budget. Now let’s get started! Keep reading for full reviews of these and other circular saw models under $100. If you find this helpful, please share this, so you can help others too! My overall choice is the: SKIL 5280-01. Want to know a little bit about the company before purchasing? It was founded in 1924, SKIL is owned by Chervon Ltd. and they’re a leader in portable electric power tools and accessories serving the do-it-yourself consumers and professional construction markets. The SKIL 5280-01 has a powerful 15 Amp motor for more power and performance. It also has a single-beam laser that guides users to cut more accurately while the integrated dust blower keeps the line of cut sawdust free. Can you believe it for a budget circular saw? And if you’re still not convinced, the bevel can be adjusted up to 51°, with positive stops at 45°. Like all the corded products I have reviewed in this price category, the size of the blade is 7 – ¼ inches, which is great for cutting large materials or objects. I give this product 5 stars, it has outstanding customer feedback and the manufacturer has a lot of experience making circular saws. Now if you’re wondering why I consider this product better than the Milwaukee 2630-20, here are some reasons why. One of the most important reasons is the blade size, as you’ve read above the SKIL 5280-01 has a 7 – ¼ inch blade and the Milwaukee 2630-20 has a 6 – ¼ inch blade. Another great feature the SKIL 5280-01 has is its’ laser guide which the Milwaukee 2630-20 unfortunately doesn’t have, this is great feature if you want easier straight line cuts without a jig and if you’re just starting out with circular saws. These circular saws can be used for long jobs and home use, these are the finest models under this price range. Makita is a well-known manufacturer of high quality power tools. The HS7600 has a motor of 10.5 Amp, and believe it or not it’s actually the lowest power one in the corded category. So if you’re looking for a powerful circular saw, I suggest you look at the other models below. Although it’s not as powerful as the others it does deliver 5,200 RPM for performance and has good job site durability. This model has a large cutting capacity, in fact it can cut 2-½ inches at 90º and 1-⅝ inches at 45º. And speaking of cuts, the blade size is 7 – ¼ inches, which is the same as the other corded models and delivers fast and clean cuts. It gets better, this design is well-balanced and lightweight for superior handling, comfort and performance. Another great feature about this design is that the lower guard improves performance when making bevel cuts, which can be adjusted up to 45º, which is great for narrow cuts. If that’s not enough to convince you, it has a heavy gauge aluminum base engineered for improved durability and straighter cuts. Some other features that make this product easy to use and great to work with are the easy-to-read markings on the depth and bevel scales, an on-board blade wrench, a flat motor housing design for stability when changing the blade and it comes with carbide tips that are specifically set to withstand the harshest conditions such as plowing through nail-embedded wood! I give this product 4.5 stars, it’s not one of the most powerful model but it sure has some great features that make it stand out. Related: What is a circular saw base plate? As you’ve read above this is my overall pick out of all the models under this price range, and here’s why! This item has a powerful and well built 15 Amp motor, that can run up to 5,300 revolutions per minute. Yes, it’s true! The bevel can be adjusted up to 51º, with positive stops at 45º which gives you the opportunity to have wider variety of angles and miter cuts. Again this model has a 7 – ¼ inch blade, that’s actually a 24-tooth carbide blade. Which will cut anything in your way! And if you’re thinking that’s it, wait until I tell that it has a spindle lock that makes the change of blade feel like a few seconds. But what makes this so special? The greatest feature is the single beam laser guide, that helps you make straight cuts with increased accuracy, while the integrated dust blower keeps the line of cut sawdust free. If you’re concerned about accidental startups and have had trouble before with previous models, there’s no need to worry about that because it has a guarded trigger that’s built to ensure your safety! What’s the catch? Unfortunately it comes with a steel base plate, which is strong enough for ordinary use, but it can be easily bent if dropped. Aluminium or magnesium are stronger materials but you’re probably not going to find one in this price range. Needless to say I give this model 5 stars, it not only has outstanding features but great customer ratings too. The only problem is that it only comes with 1 year of warranty, which is quite little if you look at the other products. Check out the current price and customer reviews of the SKIL 5280-01 here on Amazon. Here’s one company’s story: Hitachi is a Japanese company that was founded in 1948. They’re a top selling brand that provides high quality power tools. The C7ST has a powerful 15 Amp motor that can tackle through tough cutting jobs, that provides the stability and power any professional or diyer needs from their tool to get the task at hand done. Repeatedly it has a 7 – ¼ inch blade that has a speed of 6,000 RPM for smoother, faster and burn-free cuts. The bevel can be adjusted up to 45º, being able to make cuts of 1 – ⅞ inches at 45º and 2 – 7/16 inches at 90º. Another great feature is the integrated dust blower for a clear line of sight and clean work surface while cutting, which help you have better finishes. This design has a soft grip handle that reduces vibration and increases comfort. Sounds impressive, right? It even has a blade guard that protects your hands during angled cuts and the low center of gravity keeps the saw close to the work area for more accurate cuts. I give this item 4 stars, it has good customer reviews and the brand provides professional-grade power tools that have improved the quality of contractors worldwide. Still not convinced? It comes with a 5 year warranty too! The ZRCSB144LZK by Ryobi has a powerful 15 Amp motor for high performance cutting. It has an adjustable bevel from 0 to 51.5º, with positive stops at 45º and 51.5º. It even has an air diverter and dust exhaust to keep the line of cut clear while directing particles away from the user. Like previous models, this item has a 7 – ¼ inch blade, that can easily be replaced or changed thanks to the spindle lock. But you know what else? It has an Exactline laser alignment system that improves cutting accuracy, and if you’re a beginner trust me this is going to save you a lot of time and you’ll have great finishes. Surprisingly enough none of the cordless models have the laser feature! I give this item 3.5 stars as it comes from a trustworthy company that will meet your expectations. The only inconvenience is the fact that it only comes with a year of warranty! Check out the current price of the ZRCSB144LZK by Ryobi here on Amazon. The Ryobi P507 works with 18 Volts Lithium Ion Batteries, and it’s actually part of Ryobi’s One+ family, so if you own any other Ryobi One+ battery you can use it with this product. Sounds great, right? Starting off, this model has an onboard guiding base that allows you to maintain precise control over your cuts with both hands on the power tool. It also has a rubber overmold on the grip that allows you to maintain a comfortable and firm grip, even in slippery conditions. The bevels adjustment is easy to use and can be adjusted up to 56º which is actually the highest in both the corded and cordless categories. It also allows the user the ability to cut in the most common angles. As for the blade, it comes with a 24T, thin kerf, carbide tipped saw blade that’s 6 – ½ inches. If you’ve been keeping up with all the models, you can see that this blade is much smaller than the corded products and you’ll unfortunately see that throughout the rest of the cordless models. This model is built from ABS material and it’s able to stand up to the wear and tear found on many construction jobs, it keeps the tool lightweight and sturdy so you can cut through wood with greater control. I give this model 4 stars, it has many great features and it comes with 3 years of warranty! The C18DGLP4 by Hitachi has a high torque motor to power through the toughest cutting and grinding applications, working with 18 Volts Lithium Ion batteries. It has a soft grip handle for improved comfort and less fatigue. It can go up to 4,500 revolutions per minute, which makes it feel like you’re using a corded circular saw, but with the portability of a cordless one! A great advantage is that it has a built-in spotlight for improved visibility of the cut line, which means you have a clearer view of your work space. It comes with a 6 – ½ inch blade, that’s actually positioned of the left side for easier operation and maneuverability. It has an adjustable bevel that can reach 50º, that allows cutting of 2- ⅛ inches at 90º and 1 – ¾ inches at 45º. It also has a feature that none of the previous models have had, an electric brake! Yes, you heard that right. With the press of a button you can stop the blade from spinning, and this could also prevent accidents! I rate this item with 4 stars, it has good customer ratings and it comes with a feature not many models have. And that’s not all, it comes with a lifetime warranty! I know, it’s unbelievable. Have you never heard of this company? Well starting off let me tell you a bit about it, they’re an American manufacturer that have 100 years of experience. They provide the finest power tools that assure to meet all of your expectations. This model is the most powerful out of all the cordless models, this high performance motor works with 20 Volts Lithium bare batteries, that deliver 4000 RPM for accurate cutting. The bevel can be adjusted up to 50º, for non-traditional cutting applications. In addition to that, this item also offers a contoured over molded handle optimized for increased user comfort. How can you resist that? I give this item 4 stars, you may wonder why? Unfortunately this model doesn’t have any of the additional features like the spindle lock, electric brake or laser guide but it sure does have great customer reviews that are very satisfied with this product. It also comes with 3 years of warranty which could be a bit more but it’s not bad! To begin with here’s Milwaukee’s story, they’re an industry leading manufacturer of heavy-duty power tools, accessories and hand tools for professional users worldwide. Their goal is to deliver advanced solutions for the trades that offer increased productivity and unmatched durability. This product works with 18 Volts Lithium Ion batteries which provides longer run time and up to 20% more torque for powerful cuts. It can easily and quickly cut tough materials, working at 3,500 revolutions per minute. Which if you have been listening isn’t much compared to the other cordless models and even so the corded ones. It comes with magnesium upper and lower guards that provide durability to protect the blade from any accidental drops. But you know what else? This design has a soft-grip handle with purpose to provide superior comfort and balance for easy controlled cuts. It also has an easy to read aircraft aluminum shoe which decreases the weight and increases the accuracy in rip cuts. Imagine this, you’re working and have no idea how much battery you have left. Well there’s no need to worry while you work because it comes with an on board fuel gauge displaying the remaining battery charge. This gives you the opportunity to have full attention on the job at hand! We’re not done yet! It comes with a 24T Carbide Blade that’s 6 – ½ inches. And there’re more, the bevel can be adjusted up to 50º. To top it all off, it comes with an electric brake that can save you a lot of time when you’re going to change the blade or just to put it away for the day. I give this model 5 stars, it’s a great company that’s known to have the best power tools on the market. This item has great reviews too and if you’re still not convinced, it comes with 5 years of warranty. Blade size: if you know you’re going to be working with large elements, then I suggest you look at models with larger blades. In this case I recommend the corded products. Power: think about what project you’re going to be using the saw for, if it’s quite a big project then go for a corded model which are actually a lot more powerful. But if this is not your case then a cordless model is your best choice and you get the plus of not having a cord in your way. Electric Brake: personally I think this is a very important feature that most of these products don’t actually have. Apart from saving you time from having the blade spinning for a few good minutes, this is also a safety feature since having a sharp blade spinning is never a good idea. Spindle or Shaft Lock: this feature basically gives you the option to stop the blade from turning in order to replace it with a new saw blade. It also keeps the blade locked, in order for it not to move around while you’re working. Warranty: when making an online purchase, you should always consider warranty as a very important factor. Any item could be damaged when shipped and this will assure you get a new model if damaged in any way. Look for longer warranties! Bevel Capacity: this is also very personal, it all depends on the job you need it for. The maximum the bevel can be adjusted determines the size of the cuts, which is crucial when buying a circular saw. Bevel Stops/ Presets: this allows you to adjust the different angles, and you can easily change between them. Every model has their respective angles with the size of each cut. You should look for models with more than one bevel level as this allows you to have better finishes. Laser Guide: if you’re not very comfortable with circular saws, I recommend you look for a model that has a laser guide, this feature allows you to make straighter cuts and gives you a clearer view of what you’re working on. It also leaves you with high quality finishes! So how do you feel after reading all these essentials factors? Are you ready to make your final decision? It really is that simple! This is the part where you should have a couple of models in mind, the shorter the list the better! Before we go any further I want to make a quick reminder of the best choices in the corded and cordless categories. I have picked the Milwaukee 2630-20 as the best cordless circular saw, this will 100% meet all of your expectations for a cordless saw. As the best overall pick, I highly recommend the SKIL 5280-01, this saw has great features that will not let you down. Lastly remember to look at the Buyer Guide to make the smartest decision that’ll you be very pleased with. All in all I hope this review has solved your problems, and has given you all the details you were looking for! Now go out there and place and order!